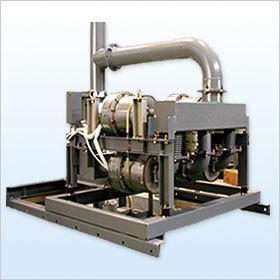 The DPF (Diesel Particulate Filter) equipment to remove the black smoke by which a large-volume diesel engine for tracks is included in the exhaust gas is being manufactured as environment related equipment. It takes the future regulation reinforcement into the consideration and has achieved purification rate of 100% of black smoke. Again, also the removal of CO2 and NOx, CO2becomes possible by getting the catalyst muffler.The most suitable equipment is proposed by the exhaust capacity of the diesel engine.